An amazing species fully deserving of the WOW Factor award ! Endemic to Thailand, the Philippines, Sumatra and Papua New Guinea, this species is amazingly temperature tolerant, growing outdoors in Southern California down to 39 degrees with any damage to the leaves, yet taking the summer heat up to 105 degrees. Its large 2” flowers will appear upside-down (resupinate) amid the leaves, the flowers’ fragrance being similar to cloves. 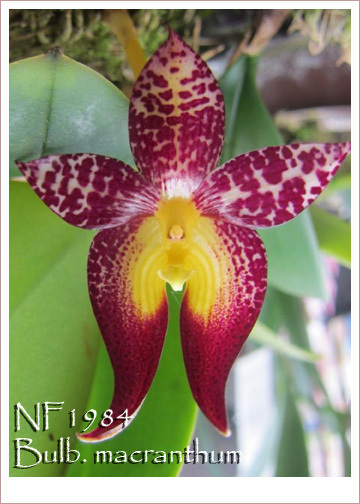 Easily grown warm with Phals, these plants are mounted on cedar for best growth and flowering. Very Highly Recommended !. Strong 2000+ F.C.,Medium 1000+ F.C.,Low 800+ F.C.